Important note: Airline is no longer in operation. Please choose from other Indian carriers. They are also required to carry their debit/card or the copy of the same signed by the cardholder at the time of check in. Check in opens 2 hours prior to scheduled departure and remains open till 45 minutes prior to scheduled departure of flights at the airport. Web check in begins 24 hours prior to scheduled departure and remains open till about 2 hours before flight. For web check in, you need to have PNR no, Origin station and last name of passenger. Passengers with check-in baggage are required to report to counter at least 2 hrs before scheduled departure time of flight. Not being able to come in stipulated time for check in would result in a ‘no show’. Boarding gates close 30 minutes prior to scheduled departure. 6. Obtain print out of boarding pass. We would request you to be more specific in making enquiries. My flight is on 24 june.so can you explain the whole process of what to do next.i will be traveling in flight for the first time.and if the baggage allowance is 20kg per person.cam I take a bag of 40 kg for 2 persons? No check in bag shall be more than 32 kg. Therefore, you can take 2bags of 40 kg total for 2 people travelling on same PNR but with no single bag more than 32 kg weight. Please speak to airline about it. Sorry, we can not provide it. Please contact airline for this matter. Please use Manage Booking service online. This is present on left side panel of aircosta website. Hi this is Nvksg Rajasekhar I have a flight on 18 th March Of 2016 . 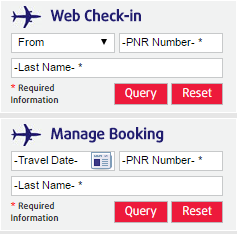 For boarding pass purpose I have used web checkin in air Costa and I have entered my pnr , last name and origin then clicked on submit but it shows no records found. So how can I get it through online. Sorry for being late to reply. We nearly lost your message. You would have already taken the flight by now. W.r.t. your query, you shall wait for it to appear in email. If not, you shall retrieve your booking to seek it once again or call up the customer service of airline. I did web check-in and I was unable to save the BP.So I do not have the print out of the BP. Will I be able to retrieve my BP? Hi I am coming on Jan 28th morning 5.50 am to Chennai from Bangkok and there is a flight from Chennai to Bangalore at 7.20am on the same daty .If i go for web check in and will it be okay if i come to check in departure place by 6.20-6.40am and i have a luggage of 15kgs suitcase .Please let me know whether i can check in or will be \"no show\" for me . After check in and security clearance, you would be required to report for boarding at least 30 minutes before flight time. If you think, you can manage it, please make your own judgement accordingly. Web check in will remain open till 2 hrs before the flight, but since you would be coming from an intenational flight and would be requiring same baggage allowance, you will need to show the boarding passes as proof at the checkin counter of the airline at the airport.If you web check in with check in luggage, you are required to report to check in counter at least 2 hrs prior to scheduled departure. You are also required to report for boarding at least 30 mints before the flight departure.